POPLARVILLE - The offices of the Pearl River Community College Development Foundation and Alumni Association have been named in honor of Verlene Cole of Oak Grove. College officials announced the decision Dec. 7 at a dinner sponsored by the Development Foundation. “She means the world to us,” said foundation director Ernie Lovell. Cole, 85, was a Pearl River student in 1949-51. The announcement took Cole by surprise. Verlene Norton enrolled at Pearl River in the fall of 1949, planning to become an elementary school teacher. She played basketball, worked in the registrar’s office and joined the Wesley Foundation and the Math Club. She received the college’s Citizenship Award her sophomore year. After graduation, she took a temporary job at First National Bank of Hattiesburg to earn tuition money. But the pay of $142 a month was so good, she never left the bank and was the first female promoted to officer in 1970. By the time Cole retired in 1989, the bank had become Bancorp South and she was first vice president. Cole helped form the Forrest-Lamar chapter of the PRCC Alumni Association and continues to be an active member. She served on the Development Foundation board from 2005 until earlier this year, serving as chairman in 2009-10. The Alumni Association awarded Cole the Distinguished Service Award in 2005 and the Alumnus of the Year Award in 2009. She funds scholarships through the Development Foundation and the scholarship given annually by the Forrest-Lamar Alumni Chapter is named for her. Cole and her late husband, Harry, are the parents of a daughter, Linda. 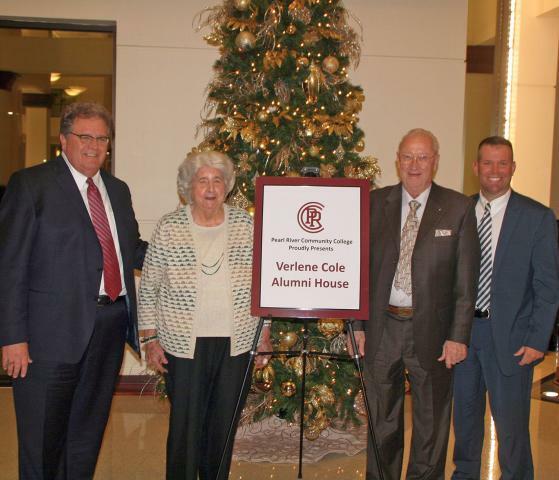 The Pearl River Community College Development Foundation and Alumni Association surprised Verlene Cole of Oak Grove with the decision to name the Alumni House in her honor. Pictured with her at a Dec. 7 dinner on campus are, from left, Foundation director Ernie Lovell, Foundation chairman Francis Herrin and Dr. Adam Breerwood, PRCC president.